'No' is a powerful word. We’ve made it so because it goes against whatever we’re feeling or wanting at the time. Getting a no can be demoralising at the time and sometimes the feeling of rejection stays with you. Not usually enough to affect your daily life, but enough for it to reignite whenever you’re about to ask another question. You don’t want to feel that sense of rejection again, so you don’t ask the question. And you know what happens when you don’t ask the question? Nothing. If you don’t ask, they can’t say no and you don’t get that feeling of rejection. But if you don’t ask, they can’t say yes either. Giving them the chance to say no is better than never asking. 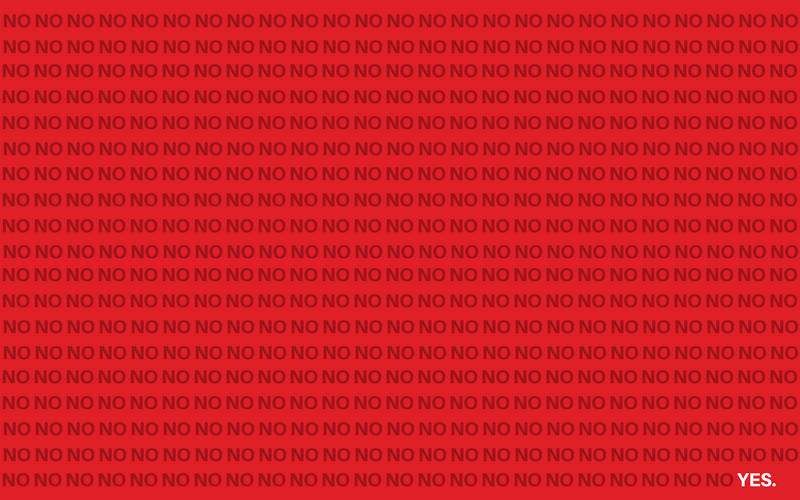 The fear of getting a no is a big thing in pitching for work. Pitching is you touting for a job, often out of the blue. And cold pitching increases the risk of getting a no. One no is disheartening enough, but a few no’s in succession can really knock confidence, to a point where you no longer want to pitch. There’s a way around this, though. Stop making no bigger than it actually is. A hundred no’s aren’t anywhere near as powerful as one yes. Have you ever heard the one about the Colonel? Harland Sanders was a 65-year-old retiree living on a $105 a week social security cheque when he began driving across America and frying chicken on spec. He would turn up and cook on the spot for restaurant owners. If they liked it, a handshake agreement was struck — the restaurant would sell the chicken (cooked using the special 11 herbs and spices recipe) and give Sanders a small percentage of the profits. But for a long time, people weren’t interested. Legend has it that it took 1010 attempts for Sanders to sell someone on his recipe. He was told no 1009 times before getting a yes. The only way he could have possibly achieved this is by not getting bogged down by rejection. The determination to get a yes outweighed the dejection of a no. Colonel Sanders’ face now adorns KFC restaurants in 115 countries. By sending out that pitch, asking that question, the worst response you can get is no. “I’m a writer. I’d like to write for you. Here's what I can do..."
Fair enough. You're not for everyone. Cross them off the list and move on to the next one. No one is harmed. Your ego might be a little bit dented, but nothing more. They said no. That wasn’t the answer you wanted. So keep asking questions until you get the answer you do want. And if you keep going, you will get the answer you want. As someone who has been rejected dozens upon dozens — if not hundreds — of times, I can tell you first-hand that someone will take a chance on you. You just have to keep believing in yourself and your ability. No isn’t a big deal. It’s a little obstacle in the road that you can gracefully manoeuvre around and forget about.